Error: The page you are looking for cannot be found. 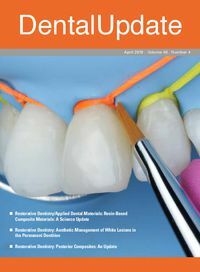 Dental Update is the leading peer-reviewed clinical journal for the dentist in General Practice. It helps GDPs face everyday challenges which occur in the surgery, offering practical and relevant solutions and keeping practitioners informed of innovative developments and clinical procedures. Readers may be surprised to read, as I remember my thoughts when first introduced to amalgam in the phantom head room in Belfast Dental School, that I can recall asking the question, ‘Why are we filling white teeth with something that is silver?’.